Wash 4 quart jars and keep hot until needed. Prepare lids as manufacturer directs. Prepare the brine by combining the vinegar, water, salt and sugar in a nonaluminum pot. Bring to a boil, then remove the pan from the heat. In each of 4 quart jars, place 1 sprig of oregano, 1 teaspoon of yellow mustard seeds and 1 teaspoon of peppercorns. Arrange the asparagus spears, with the tips up, in the jars, cutting the stalks, if necessary, to leave about 1 inch of head space. Pour the hot brine over the asparagus spears, filling the jars to within1/4inch of the top. Wipe jar rims with a clean damp cloth and attach the lids. Let the jars cool on the counter for an hour or more, then refrigerate. 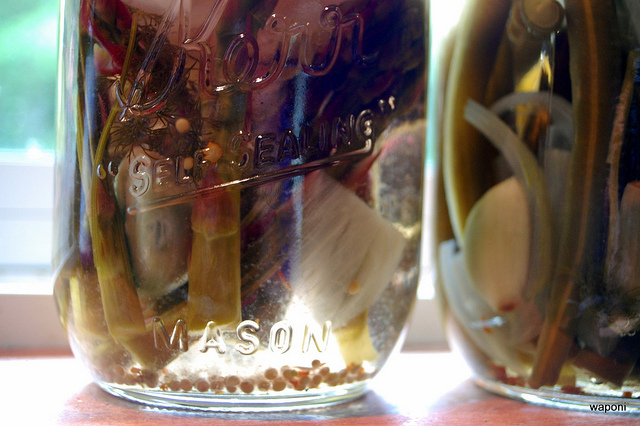 The pickles are ready to enjoy after 4 days of aging, but they will continue to improve further for several weeks. 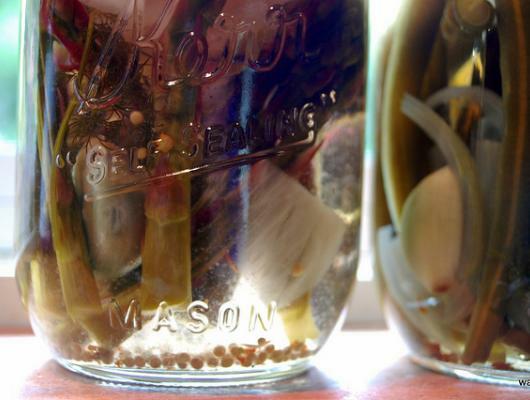 The pickles make wonderful swizzle sticks in Bloody Marys, or serve with your favorite dip.